One of the most important surveillance camera differentiators is Wide Dynamic Range (WDR) performance. Dealing with bright sunlight and shadows is a key problem for most surveillance deployments and, historically, most cameras were poor. Indeed, in our first two WDR test (see our original WDR shootout and sequel Megapixel WDR shootout), major performance variances were clear. This brought back three WDR MP veterans (Axis, Panasonic and Sony) vs three WDR MP new entrants (Arecont, Avigilon and Bosch). We focused our tests on three WDR scenes that represent common real-world scenarios. The most interesting takeaway is how much the performance gap between best and worst has narrowed. In previous tests, only one or two manufacturers typically stood out as clear winners. However, in this shootout, all new generation cameras performed reasonably well. This is especially noteworthy in the cases of Arecont and Avigilon, whose 3MP WDR models cost significantly less than other major manufacturers, such as Sony, Bosch, and Axis. The drawback of all these options is that choice in WDR cameras now becomes more complex. With more options available, more testing in place is required to determine whether a specific camera model will work in a given scene, instead of simply selecting from a small group of trusted, high-performance cameras. While more manufacturers are taking advantage of new sensors to improve WDR, this does not mean that every new camera will suddenly be strong at WDR. 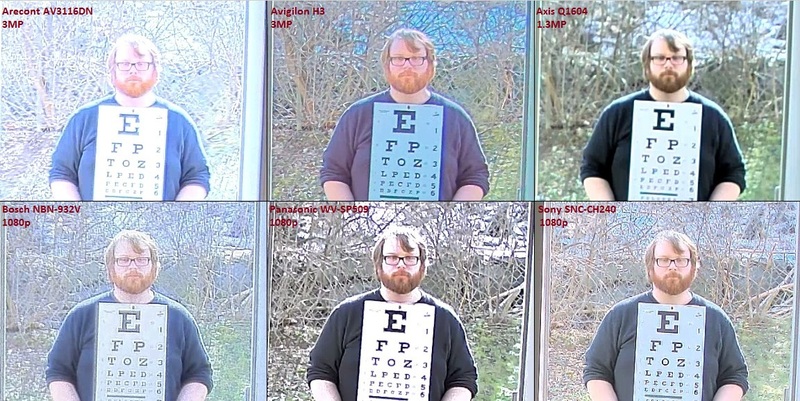 All of the cameras in this test use multi-exposure processing, a 'true' WDR technique. While we expect many more manufacturers to add such support over the next 18 months, still be careful about WDR claims. For background, see our WDR tutorial. In our first scene, typical of many scenarios WDR cameras are warranted, we aimed the cameras at and through a typical man door, in this case an emergency exit door in an office building. The width of the field of view at the doorway is approximately 13-14'. 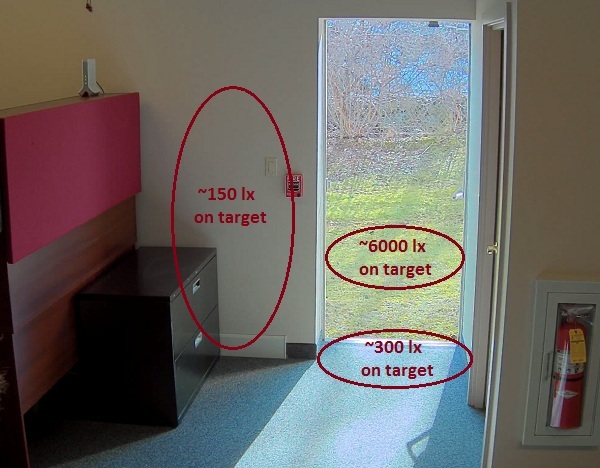 As noted in this overview image of the scene, the lux differential peaks at about 40x between the interior wall (~150 lx) and the exterior in strong sunlight (~6 klx). These samples were taken in a South-facing door around noon in order to maximum the effects of the Winter sun. In this first shot, the subject is standing in the middle of the doorway, measuring about 300 lx, ~20x difference in illumination. All cameras perform relatively well here, though the Q1604 is noticeably darker on the subject's face than others. In wider fields of view, with lower pixel density, this may become problematic. 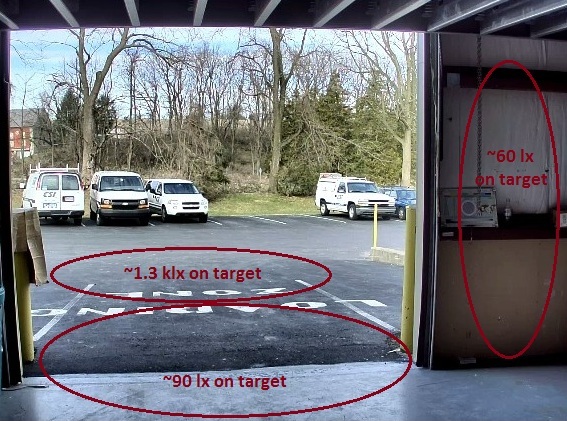 With the subject standing to the side of the door, in the darker (~150 lx) area, performance remains generally consistent with the above. The NBN-932V is more washed out than others in this scene, however, with some loss of detail on the subject. When the subject moves to the area outside the door, the brightest spot in the scene at around 6,000 lux on target, there are some noticeable performance differences. The subject's face is noticeably less clear in all cameras, with Arecont, Bosch, and Avigilon most affected. In our second scene, we set the FOV to capture the entirety of a standard overhead door, as well as a few feet next to it, to best simulate the lighting differences users in warehouses and garages may experience, for example. We left the lights off in the warehouse to create the largest light/dark differential possible on a sunny day (~11 klx measured straight up). With the subject standing in the center of the overhead door, illumination on target was measured at approximately 90 lx. Arecont and Avigilon perform best in this scene, though all cameras provide usable details, though the SP509 is verging on being too dark. With the subject located in the dark area next to the door (~60 lx on target), Axis is noticeably brighter than other cameras. Arecont, Avigilon, Bosch, and Sony perform much the same as above. 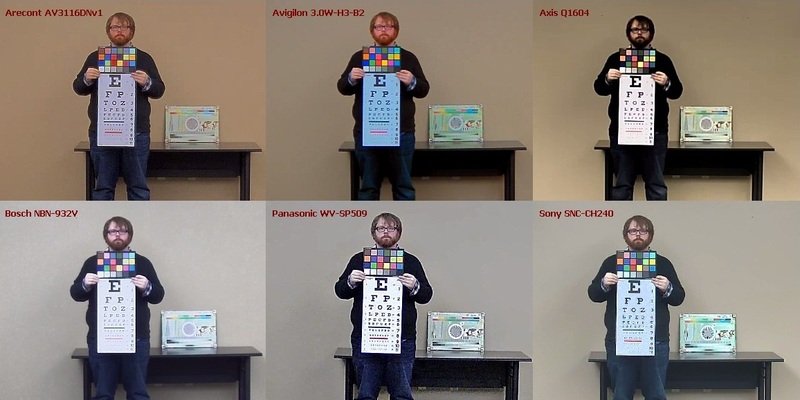 The Panasonic camera, however, no longer produces usable video of the eye chart and loses detail in the subject, though he is still detectable. Moving the subject to the outside of the warehouse, all cameras perform fairly well. Arecont displays some hazy artifacting around the subject and letters on the chart, though facial details are still visible. In our final WDR scene, we moved the cameras outdoors about an hour before sunset, with the sun very low in the sky, though not in the FOV of any camera. It was clear and sunny on this day (~16 klx measured straight up). 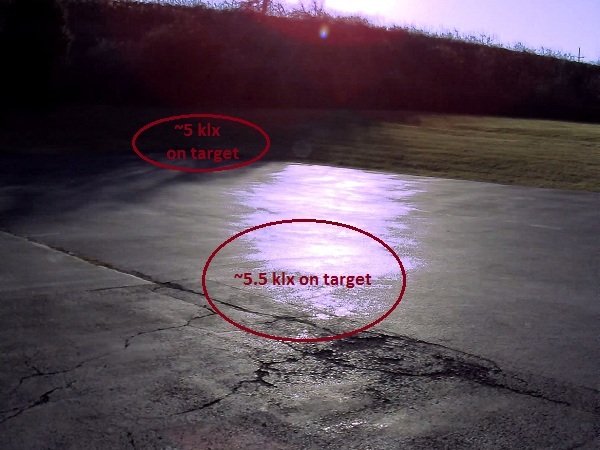 At this range, the horizontal FOV is ~20', with illumination measured around 5.5 klx on target. Arecont and Avigilon suffer the fewest ill effects from the near-direct sunlight. The subject's face is at least partially obscured on all cameras. Note that we removed Axis from these comparisons because after review, it was not in focus. Users interested in the performance of the Q1604 in these scenes may see our Q1604 Shootout Results for more detail. In this scene the subject has moved to the shady area further back in the FOV. At this distance, the HFOV is much wider, about 60'. The subject's face is obscured partly due to the lower light level in the area, though at this distance, PPF is much lower, so naturally fewer details will be visible. In order to get baseline image quality and bandwidth measurements, we set up the cameras indoors in a conference room with controlled lighting for both "daytime" (all lights on) and "nighttime" shots (lights off). These comparisons may be seen below (click images for larger version). 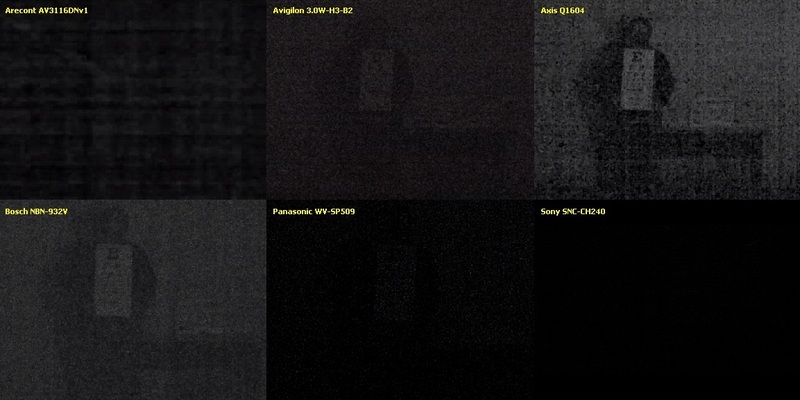 First, in the well-lit scene, we notice a difference in color saturation between Arecont, Avigilon, and Axis (all relatively true to life) and Bosch, Panasonic, and Sony, which are desaturated to varying levels. In this nighttime scene, below 1 lux, with shutters normalized to 1/30s (with the exception of Axis, which cannot be slowed beyond 1/44s with WDR on), Axis and Bosch stand out as providing the most usable image, with Avigilon moderately worse. The Panasonic WV-SP509 still displays some image of the subject, while Arecont and Sony both provide no usable video. Note that the AV3116DN features a binning mode, which is not shown in the image, to keep it standardized with other cameras. However, this mode does improve nighttime imaging and will be covered in detail in our upcoming individual test of the AV3116DN. First, the camera was reset to factory defaults. WDR was set to ON in all cameras. Shutter speed was normalized to 1/30s, in all cameras but the Axis Q1604. The Q1604 does not allow the shutter to be slowed past 1/44s when WDR (called "Dynamic Capture in configuration) is on. The cameras were set to the same field of view and auto-focused via the camera's web interface where possible, and manually when not supported. Note that some of these cameras are 4:3 aspect ratio, while others are 16:9. At least one manufacturer raised a question about this, because the 16:9 cameras' FOV may cut out extremes of light or dark which the 4:3 cameras must compensate for. This may be true in some cases, but we do not see it as having a drastic effect on performance, and these cameras must perform accordingly were these real-world installations, therefore we feel that setting the HFoV to the same width is the best method for our testing.